Attention! This is a Gotham City Police Department Public Service Announcement. 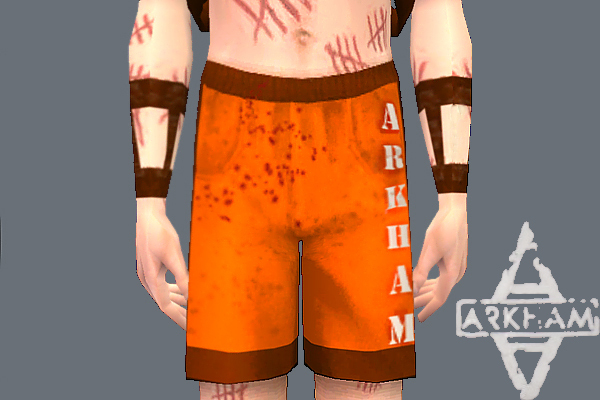 Several patients have been reported missing from Arkham Asylum and are currently considered escapees, possibly from the island, All citizens need to be aware of the danger they may pose. Each escapee should be handled differently, so a set of instructions will be released for each of them, but it is pertinate that these individuals are never directly approached. 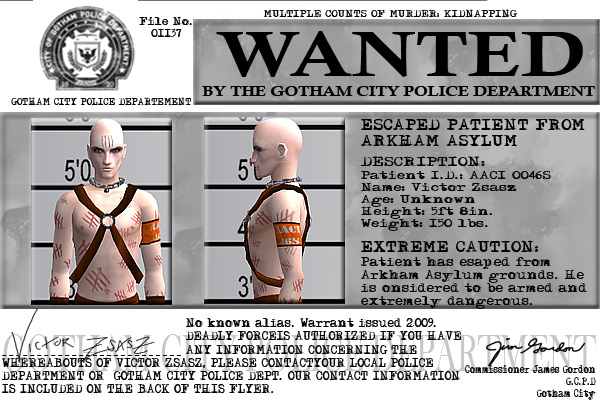 One Victor Zsasz is currently an escape as of October 29, 2009, possibly for a reoccurrence of last year’s “Fear Night” that was orchestrated by Jonathan Crane and may be repeating that night again. 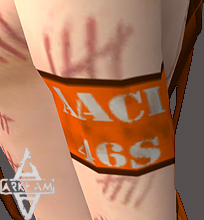 He can be idenified by the numerous "tally marks" carved into his skin, each documenting a kill. He is considered extremely dangerous. 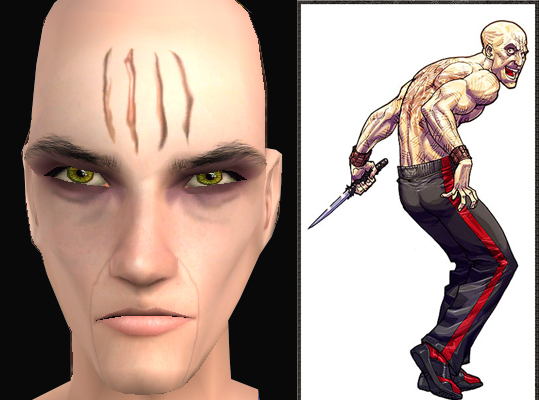 Though known for wielding only knives, he may resort to any means necessary to “liberate” as many people as possible. It is advised that all citizens stay within their homes until the escapes are detained, but it is necessary to leave, only travel is groups of no less than four people and stay in well lit and highly traveled routes. If any of the escapees are spotted it is strongly advised that you seek the nearest shealter and contact local law enforcement immediately. Extreme caution is advised. 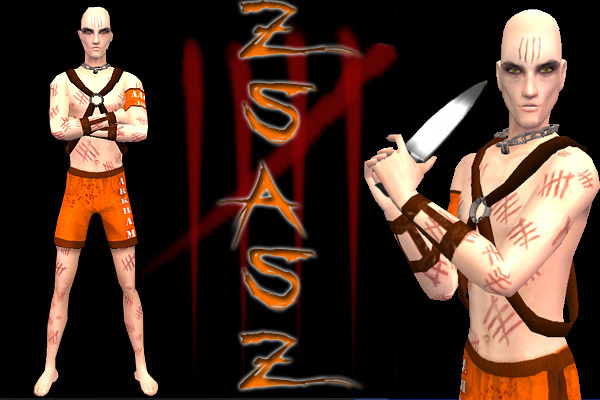 A select number of interviews of one, Victor Zsasz, have been released to better inform the citizens of Gotham City of the danger he may pose. Extreme caution is advised. A link to an online release is included below. Victor Zsasz was convicted of numerous mob related hits in the past two years and 20 murders of young women in the past three months. His killing trade marks in clued the cutting of the victim’s throat and posing their bodies in life like positions, poses that mock life. He has gone on record saying that he “liberated” his victims from their meaningless, empty lives. Zombies, unaware of a purpose or reason. I want to thank all of the artists whose creations made my sim who he is. q3tbo: For both the chain and chest strap meshes. Links to these meshes are found below. For the chest straps, make sure to download Version 0. Vampire_aninyosaloh: For the Beautiful eyes. 79 people have said thanks to Vampire_of_Death for this download. Audrey Hepburn,as seen in Breakfast at Tiffanys !